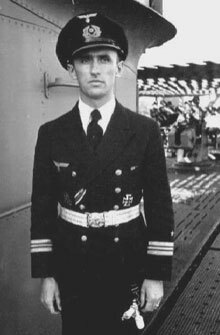 U-190 under Kapitänleutnant Max Wintermeyer spent nearly a week patrolling the area northeast of Abaco and Eleuthera in July 1943, without result. The submarine entered the region east of Savannah and headed southeast for three days until the 21st of July. Then for two days it motored east before turning northeast towards Bermuda on the 23rd of July. On the 24th the U-boat passed just to the west of Bermuda and out of the area. U-190 left Lorient on the 1st of May 1942 and aside from being attacked by a USAF Liberator off Cape Henry, Delaware, did not encounter other Allies. To quote Wynn, this patrol was typical because “a marked increase in American air activity made U-boat operations extremely difficult and ship-sinkings were few”. Wintermeyer brought his charge back to Lorient on the 19th of August 1943. A member of the Crew of 1934, Wintermeyer was promoted to Kapitänleutnant in April of 1942. Born in February 1914, he was age 29 during this patrol and is still living in end 2011. He was awarded the U-boat War Badge 1939 on the back of four patrols of 348 total sea days. Having begun his naval career on U-105 and U-62, he commissioned U-190 and survived several patrols on her to move ashore in July 1944, after which he held staff positions on land.